The Eagle LS2 is the perfect choice for drivers who want a quiet-riding, luxury sport tire. 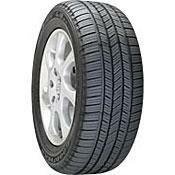 Its advanced tread pattern delivers an exceptionally comfortable ride while improving handling. For peace of mind, the Eagle LS2 is built to offer outstanding traction on rain-soaked roads. Delivered 45K miles without a problem. The tread wore evenly on all four with one rotation. Snow traction was poor but the quiet ride in warm weather more than compensated for the occasional snowstorm here. Michelin Latitude. Bring ear plugs. less than 7K miles front left side developed bubble. told from dealer it's an impact break. impact from what? driving on normal roads and freeways? Poor quality. If at less than 7,000 miles i need to replace the tire what's the point. kia dealer wouldn't even talk to me but sent me to a tire place. these tires are unsafe on any car. i'm driving a 2012 kia forte sx. cute little car with all the bells and whistles, but now i have to buy a new tire because the tires are so poorly designed. do not buy! they are not safe! Smooth ride and good on just about any surface. Have over 72,000 miles on set. Looking at purchasing another set. Approaching 50K miles. No issues to report thus far. Satisfactory in all weather. Now looking for replacement and having trouble finding tires that will out ferform for a similar price.